Inspired by the story of a distant cousin who was murdered in Paris in 1937, award-winning author Michele Zackheim’s Last Train to Paris is a gripping epic about a half-Jewish female reporter from Nevada who writes for the Paris Courier in the 1930’s. The sole woman in the newsroom, she lives with both sexism and anti-Semitism. Then she meets Leo, a German radical and anti-Nazi and realizes that while Paris is interesting, the truly vital historical story is taking place across the border. Rose undertakes an assignment in the Berlin press office, where she is initially happy and in love until Kristallnacht and the growing threat of Nazism. When World War II is declared, Americans are forced to leave the country and Rose must make an agonizing choice: Who will go with her on the last train to Paris? 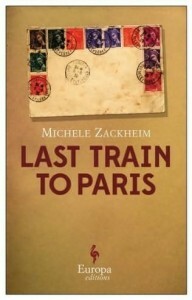 Zackheim, acclaimed author of Einstein’s Daughter, tells her story from vantage point of Rose as an elderly woman, Last Train to Paris is at once a historical epic, a love story, and a psychological portrait of one woman’s gradual discovery of who she really is after years of being invisible to herself. Last Train to Paris will enthrall the same large audience that made In The Garden of Beasts by Erik Larson and Suite Française by Irène Némirovsky bestsellers. Michele Zackheim is the author of four books. Born in Reno, Nevada she grew up in Compton, California. For many years she worked in the visual arts as a fresco muralist, an installation artist, print-maker, and a painter. 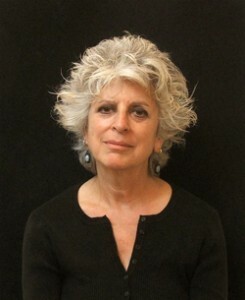 Her work has been widely exhibited and is included in the permanent collections of The National Museum of Women in the Arts in Washington, D.C.; The Albuquerque Museum; The Grey Art Gallery of New York University; The New York Public Library; The Hebrew Union College Skirball Museum, and The Carlsbad Museum of Art. She has been the recipient of two NEA awards, and teaches Creative Writing from a Visual Perspective at the School of Visual Arts in New York City. Her first book, Violette’s Embrace, was published by Riverhead Books. That book is a fictional biography of the French writer Violette Leduc. Her second book, the acclaimed Einstein’s Daughter: The Search for Lieserl (Penguin Putnam, 1999), is a non-fiction account of the mystery of the lost illegitimate daughter of Mileva and Albert Einstein. Broken Colors (Europa Editions, 2007) is the story of an artist, whose life takes her to a place where life and art intersect. Her fourth novel, Last Train to Paris, will be published in January 2014. Zackheim lives in New York City. When it comes to armchair traveling, one of my most frequent destinations is France (in general) and Paris (specifically). Outside of my imagination, I’ve never spent much time in Paris, as most of my trips to France take me to places like Montpelier, Bezier, and Carcassone. Like most people, especially those of us who love words, Paris holds a special place in my heart, and I’ll read almost anything that takes place there. Michele Zackheim’s novel has only increased that love. Bookended by glimpses of the main character as an elderly woman, the novel takes us to the Paris of the late 1930’s, where the echoes of Hemingway’s footsteps still ring out, though they’re being slowly overtaken by the marching cadence of black-booted Nazis. First in Paris, and later in Berlin, we get to witness history through R. B. Manon’s eyes, to an often-chilling result, but even before things get grim there are descriptions of people and places that simply sing. In the first few pages of Last Train to Paris, for example, Zackheim describes the hotel where R.B is living, and we meet a host of people who share common spaces with her. Some of them, we may never see again, and some go one to become important, but either way, I felt as if I could see the neighbor waving, smell the cabbage, hear the cacophony of life in crowded residential hotel in a crowded, bustling city. If you, as I did, loved Midnight in Paris, or if you’ve ever, as I have, watched old movies and fantasized about being a foreign correspondent, then you simply must read Last Train to Paris. You will not regret it. Goes well with espresso with a twist of lemon on the side, and a butter croissant. This review is part of a blog tour hosted by TLC Book Tours. For the tour page, click here.